The Iso Duo comprises an inner bowl, an outer bowl and an insulated server. The extra space on the bowl rim helps easy placing and removal. The doubled walled insulation is achieved by nesting the two bowls of different sizes together, thus creating an air gap between the walls. The cover too, is double walled. Maximum heat is retained when the server is full. 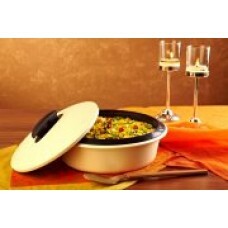 The server keeps most food hot for a longer period of time when the dish is full. A key benefit of this system is that in addition to the superb insulated serving dish for the table, you also have two separate bowls with a cover to serve hot and cold food as required. The cover fits securely on the inner bowl.